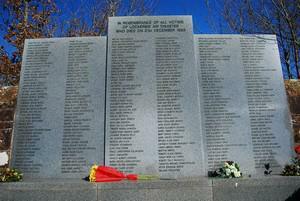 Hundreds were killed when Pan Am Flight 103 exploded over the Scottish village of Lockerbie in December 1988. Libya later took responsibility and paid compensation to the victims’ families — and one of its secret agents spent eleven years in jail for the attack. Scottish and German investigators, acting on newly revealed information, are now looking onto the possibility that agents of STASI — East Germany’s secret police — were involved. Hundreds were killed when Pan Am Flight 103 crashed into the Scottish village of Lockerbie thirty years ago. Libya later took responsibility, but investigators are now looking onto the possibility that East Germany’s secret police were involved. Berlin’s public prosecutor’s office confirmed on Thursday that former members of East Germany’s STASI secret police were questioned as part of an investigation into the Lockerbie bombing in 1988. Prosecutors “received legal requests from Scotland” over the case and ended up questioning “several suspected STASI employees” in Berlin, the Berlin prosecutor office said on Twitter. The German daily Bild reports that Scottish investigators are probing whether STASI agents were involved in or had prior knowledge of the terror plot that brought down Pan Am Flight 103. Scottish prosecutors asked the German authorities to question twenty former STASI officers in eastern German cities, Bild reported. The prosecutor’s office in Frankfurt told the dpa news agency that it had received five “European investigation orders.” The spokeswoman emphasized that the former STASI employees were not being treated as suspects. On 21 December 1988, a bomb detonated on Pam Am Flight 103 bound for New York, with parts of the plane crashing into the Scottish village of Lockerbie. Some 270 people died, including 11 village residents. In 2001, former Libyan intelligence officer Abdel Basset al-Megrahi was found guilty of planting the bomb and given a life sentence. In 2012 he was released from prison with terminal cancer and allowed to go back to Libya, where he died a few months later. He remains the only person convicted for a having a role in the bombing.